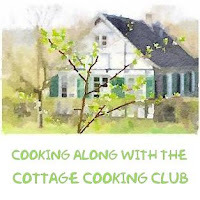 Today's post is a first for me, I joined a virtual cooking club. Let me back up a bit and start at the beginning. I have been following a wonderful blog called The Kitchen Lioness . Andrea's site is very informative with great recipes and beautiful pictures. She is located in Germany and is also a member of another cookbook club called French Friday's with Dorie by Dorie Greenspan along with her regular post. She recently started the River Cottage Veg cookbook club and was kind enough to let me participate. Andrea picks 10 recipes every month and the participants blog about them until we go through the whole book. Kinda neat huh! For my first recipe I chose the Quinoa with Zucchini and Onions. Quinoa is high in protein and gluten-free. It looks like a grain but is actually a seed and it is delicious. This is a very simple recipe; you could change out the quinoa with couscous or the zucchini with most any other veggie. Basically you cook the quinoa, saute the onions and vegetables, add your garlic and herbs and there you have it, a great dish. I followed the recipe very closely except for the substitution of the soy nuts for the pine nuts. I would definitely make this dish again. Recipe adapted from River Cottage Veg by Hugh Fearnley-Whittingstall; cookbook chapter Pasta and rice, page 279. Here is the link to the Cottage Cooking Club. Thanks Tandy, it's getting easier and easier. We are fans of quinoa! This looks wholesome, Cheri. Hi Angie, this is a great recipe, so versatile! I'm excited about this group - my partner and I are trying to work more vegetarian dishes into our diet. Your quinoa dish looks like it turned our perfectly! Thanks Teresa, really enjoying this book. Hi June, it is a great cookbook, thanks! Thanks Phi, it is a great summer dish. Count me in for quinoa! This looks like a very veggie good dish :), lol. Thanks for sharing! This cooking club sounds so fun! Hi Natalie, it is fun, thanks! Great pic, love zucchini - it's sweet like candy, but good for ya! Happy to find you via CCC. I know what a great way to connect with someone! nice to meet you Coco! 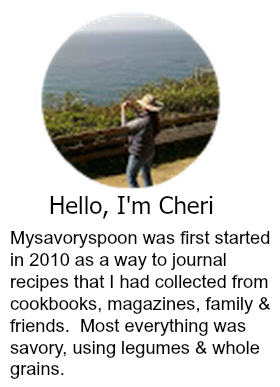 Dear Cheri, thank you so much for the kind comments about my blog - I certainly appreciate them! Your quinoa with zucchinis and onions looks divine - I loved that dish so much too, it was my 13-year-old daughters favorite recipe this month! Thanks again for the kind words, for the participation and your enthusiasm! Hi Andrea, what a wonderful experience, I can only hope more people join to have this great adventure. Cheri, absolutely! Maybe you can convince some lovely blogger friends of yours to join! This sounds like a fantastic summer side dish recipe! No problem, quinoa is so good in so many social situations. It';s delicious and so good for you. I was planning on making this dish but the zucchini didn't look too great. I can't really get good zucchini until July. Will keep this in mind. Hi Diane, I know it's all about the produce, zucchini grows like mad here. It's all about whats available. We have a lot of zucchini in our garden right now so am very happy to have another way to fix it! I love the way you are working through an entire cookbook. What a fun idea. Thanks for the great recipe, Cheri! Hi Shari, you should join if you can, another alley. This is such a simple idea and yet I don't think I would have thought of combining zucchini with onions and quinoa. It really sounds delicious, though, especially sprinkled with the pine nuts. Is there any kind of sauce or dressing, or are the veggies served as they are? Either way sounds good to me, but just wondering! Hi Helen, just a squeeze of lemon, if so desired. Thanks! I am amazed that you can keep up with your blogging and move at the same time, Cheri. I'd be a mess,lol. This sounds like a great tasting recipe and right up my alley. Will definitely be making this - thanks so much for sharing it! Hi Robyn, oh things are a mess here, you can be sure. Thanks! Such a great idea! I love Hugh and I really need to invest in this cookbook. All the cooking club photos are just making me want to read it even more! It is a wonderful cookbook, the recipes are simple and the ingredients are readily available. Thanks! It's no secret that I'm obsessed with quinoa so this recipe is right up my alley. Sounds like you're enjoying quite a bit being part of that cooking club, good for you! Hi Mike, I am, it's my first post with the club, but so far so good. How fun! I'm a member of FFWD, and love the community, so wanted to cook along with Andrea - she is, as you say, amazing. This is one of the recipes that I did NOT get to, though I love all of the ingredients, so will get there one of these days. Your dish looks amazing! Thanks so much, everyone is so supportive, and the book is fantastic! Sounds like a terrific cookbook and group! Certainly this dish looks great. Looks like it has wonderful flavor, and so healthy! Good stuff -- thanks. It is, thanks! having a great time, you are welcome to join, if you like. Looking forward to cooking with you! Love this book! Hi Christy, thanks I look forward to cooking with you as well, love your site. Not bad, I saw some zucchini in my store lately...now I can see what I would want to do with it! Thanks! Hi Ela, you would love this! I made this dish as well. It was so quick and easy! If there is a next time, I want to change out the pine nuts for hazelnuts, and the parsley for cilantro. This is definitely one you can play around with. So far, loving the book! Hi Cathleen, those changes sound delicious, I am a big fan of cilantro. I'm excited to be doing the CCC with you! Your quinoa came out beautifully. I am vegetarians on Tuesdays and will have to make this recipe. Sounds like a great event to participate in.